Derrick Procell, AKA Derrick an American, has been singing all of the forms of American music for decades. In the words of Grammy Award-winning songwriter, Terry Abrahamson, " If Mt. 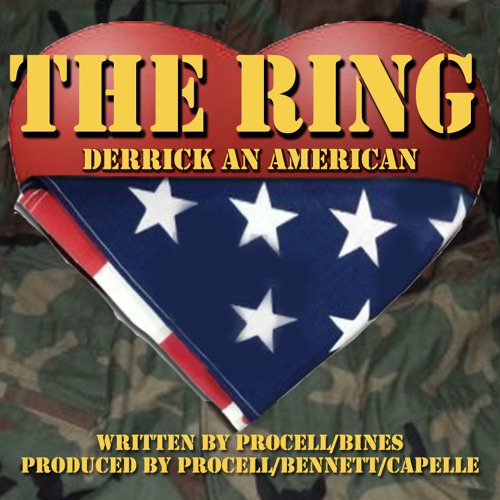 Rushmore could sing..." The single, The Ring, came about in a most mystical way. As co-writers Procell and Steve Bines attended the memorial service of their fellow musical friend Todd Galanter, they chatted briefly about some poignant lyrics that Bines had written. He had yet to find the right music to deliver the powerful story of undying love in the face of the horrors of war. Procell provided the musical backdrop and voice that Bines had been looking for. The demo quickly sparked the interest of Chicago production team Tim and Jay Bennett, and their collaborator Nic Capelle. Sons of Chicago engineering legend, Bob Bennett, Tim and Jay were spiritually connected to the project- years earlier their father had engineered and produced several of Derrick and Todd's bands. The energy behind the project was undeniable. The result is musically and emotionally profound.